The Deluxe Animus Megazord is the US version of the DX Chogokin Hyaku Juu Gattai Gao God from the sentai series Hyakujyuu Sentai Gaoranger. Bandai America imported this toy and released it as part of it's Power Rangers Wild Force toy line. I'm not going to even try to describe what the series was about. For that, check wikipedia. What I can tell you though is that this figure is very cool, and one of my favorite releases from Wild Force / Gaoranger. 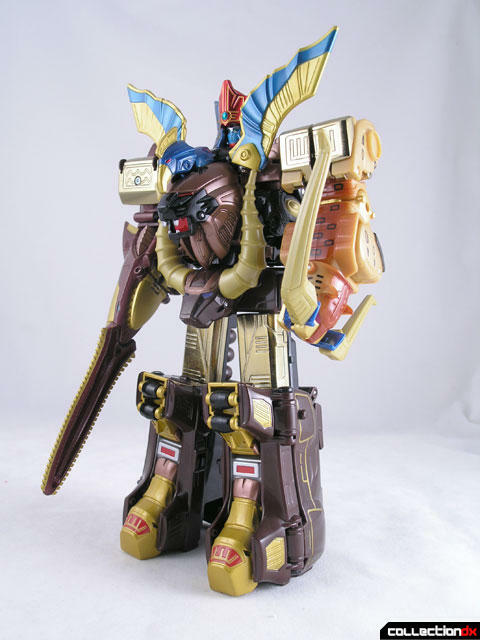 The Deluxe Animus Megazord is based off of the Deluxe Wild Force Megazord. While the design is similar, very few of the parts are actually the same. This shark features wheels on the bottom, a moveable jaw, fins, and a detachable tail. The lion appears to be the same as the one used in the Deluxe Wild Force Megazord, aside from different coloring. The condor features a new head and tail unit, redecorated wings, and metal feet. The Bison is similar to the Bull used on the Wild Force Megazord, with different detailing, coloring, and different horns. 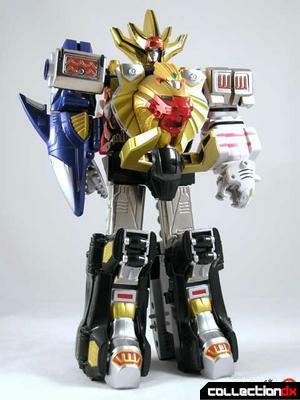 The Leopard is similar to the tiger used on the Wild Force Megazord, with different coloring. The combination is similar to that of the Wild Force Megazord, with a few notable exceptions. On the chest of the Animus Megazord, the wings point upward and outward. The horns on the head become a kind of bow weapon that can be held in the mouth of the Leopard. Once again, this release retains all the metal of the DX Chogokin version. This is one heavy bot. If Bandai still made them this way today, I would still be a Sentai Fan. So, what's different in this release from the Japanese release? The only thing I can see is that the gold metal shoulder plates are re-used from older US zords and not the ones that come with the Japanese version, which also has paint detail. Thats about it as far as I know, but perhaps purists will correct me. Umm... "purist", here. While I actually don't own or like the Gao God/Animus (as far as a repaint), I do know a few things about it regarding the conversion. None of the decals were imported over, which occupy the front of the metal on both shoulders and the front (both inside and outside) of the lower legs. On the lower legs, these were simply replaced with gold paint; though, again, no paint was added to the inside of the lower legs. Whereas on the Deluxe Wild Force Megazord red paint was added to the shoulder armor in place of the decals, none was added to Animus to replace its own. All ABS that had a metallic finish to it on Gao God (Saw Shark's gills & the space between Brown Bison's retracted legs) was replaced with painted equivalents here. Oh, BTW, despite what appears on the front of Animus' box, Gao God never used Gao SawShark's tail as a weapon; depending instead on his long saw-like nose for close-range use. And when his nose was paired with the bow from his head (which neither toy can recreate), you got the Tenchu Power Arrow finisher. The position of the wings in front of the Animus Megazord should be parallel to the shoulders of the zord itself. Just an observation. And I do own the Japanese version as well. Naw- they look okay. So long as the wings are even extended on Gao God, it looks fine. Thing is, if they're perfectly horizontal, then you can't bend the arms forward! Umm... do you always bold when you post a message? That's just my style when I post. I can see words better when they are in bold since I'm nearsighted. The horned animal in the ORIGINAL set was the Bison; this one is the Bull or Buffalo.